Although tobacco, Nicotiana, is indigenous to the Americas, some records have suggested that its use for smoking was first introduced in the late 1700s by Euro-American explorers and traders to tribes living in northwestern North America. It was assumed that, prior to contact with trade, or cultivated, tobacco, Nicotiana tabacum, these communities smoked primarily Arctostaphylos uva-ursi, a plant known as kinnikinnick, or bearberry. New biomolecular research, however, has found evidence that ancient populations were smoking tobacco long before contact with Euro-Americans. 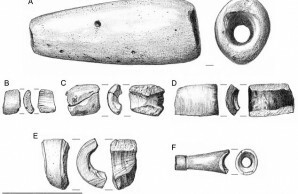 Anthropological archaeologist Shannon Tushingham, at Washington State University, led a team, in collaboration with the Nez Perce Tribe, that analyzed a dozen stone pipes and fragments for signs of ancient tobacco use. The artifacts came from sites in the ancestral territory of the Nez Perce along the Columbia and Snake Rivers in southeastern Washington. Using new experimental protocols for liquid chromatography-mass spectrometry, the researchers extracted residues from the pipes using a solvent that left the artifacts intact. The residues were analyzed for chemical signatures of nicotine and arbutin, compounds associated with tobacco and kinnikinnick, respectively. The research team found signs of nicotine on eight of the pipes and fragments. Signs of tobacco use showed up on artifacts dating back to 1,200 years ago. “This research confirms a continuous tradition of tobacco use by the Native peoples of the region for over 1,000 years, at least,” said William J. Damitio, a doctoral student under Tushingham. Contrary to expectations, none of the analyzed pipes yielded evidence of kinnikinnick. The researchers report that kinnikinnick may not have been as dominant as ethnohistoric accounts suggest, or perhaps their methods were not sensitive enough, or the sample size large enough, to detect smoking of this plant.